Dynamic forces come together to make this garnet ring set a glorious one from the Apples of Gold jewelry collection. The deep scarlet gemstone simultaneously evokes romance, passion and vitality with its bold color. 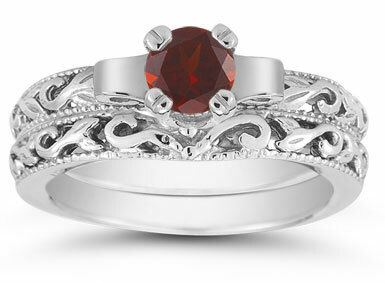 The 5mm garnet is set in white gold and mounted high above the rings. The white gold blends seamlessly into the rings, which each exhibit art deco qualities. The precision of artwork is seen in the elaborate scrollwork carving of the bands, which are polished to shine as brilliant as the garnet in this remarkable ring set. 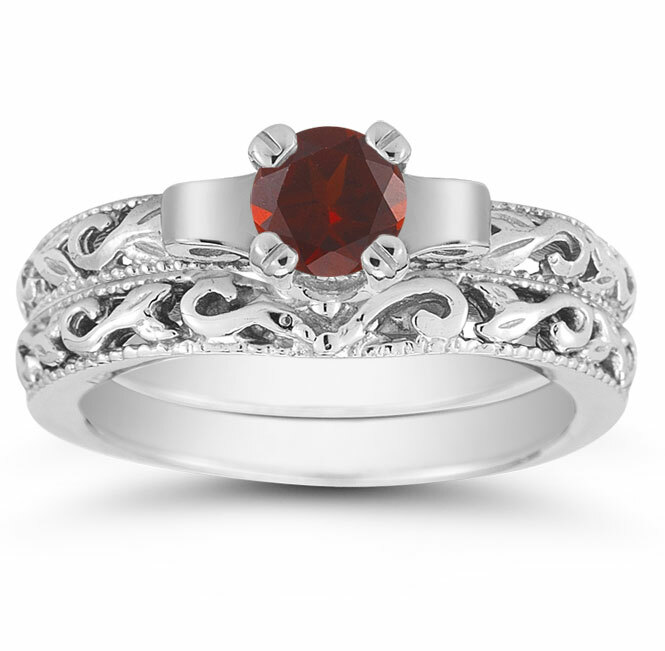 We guarantee our 1/2 Carat Art Deco Garnet Bridal Ring Set, 14K White Gold to be high quality, authentic jewelry, as described above.